All aboard for a delicious ride on nine legendary railway journeys! Meals associated with train travel have been an important aspect of railway history for more than a century – from dinners in dining cars to lunches at station buffets to foods purchased from platform vendors. For many travellers, the experience of eating on a railway journey is often a highlight of the trip, a major part of the ‘romance of the rails’. Food on the Move focuses on the culinary history of these famous journeys on five continents, from the earliest days of rail travel to the present. 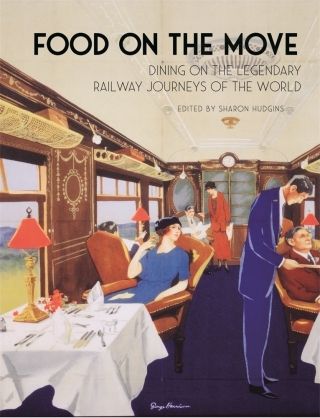 The engaging story and vivid illustrations invite readers to discover an array of railway feasts: haute cuisine in the elegant dining carriages of the Orient Express, American steak-and-eggs on the Santa Fe Super Chief, and home-cooked regional foods along the Trans-Siberian tracks. Readers will be tempted to eat their way across Canada’s vast interior and Australia’s spectacular and colourful Outback; grab an infamous ‘British railway sandwich’ to munch on the Flying Scotsman; snack on spicy samosas on the Darjeeling Himalayan ‘Toy Train’; dine at high speed on Japan’s ‘Bullet Train’; and sip South African wines in a Blue Train luxury lounge car featuring windows of glass fused with gold dust. Written by eight different authors who have travelled on those legendary lines, the book include recipes, from the dining cars and station eateries, taken from historical menus and contributed by contemporary chefs. Food on the Move is a veritable feast! Sharon Hudgins is an award-winning author, with five non-fiction books and hundreds of food and travel articles published worldwide. Her books include The Other Side of Russia: A Slice of Life in Siberia and the Russian Far East (2003) and T-Bone Whacks & Caviar Snacks: Cooking with Two Texans in Siberia and the Russian Far East (2018).